Cut off about one inch of the stem on the bottom of the flowers to guarantee a more effective absorption of water. Once you have all the flowers into the vase, snip off any leaves that appear to fall below the water line. 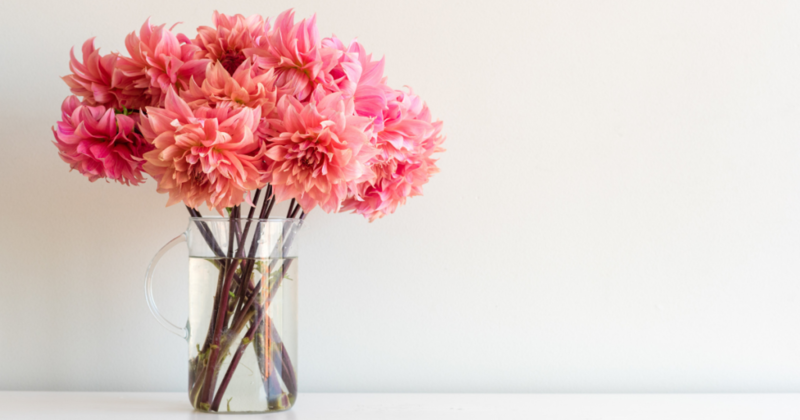 But be careful not to cut off too much of the stem as your flowers typically need to appear larger than the vase overall for a balanced look; a good ratio would be about twice the size of the vase at most. For an arrangement that’s exciting in every angle, choose a variety of flowers of all shapes and sizes. For a more cool, monochromatic look, choose flowers that are of similar color but different textures. Lastly, when putting it all together, make sure to put in the larger flowers in first so that it appears even when you gradually add in smaller ones. Sometimes choosing the right vase is just as important as the flowers in them. You can never go wrong with clear vases as long as the stems of your flowers appear healthy and sturdy. Slim, cylinder vases are perfect for displaying a modest set of flowers whereas trumpet-shaped vases that flare at the top call for a more exciting arrangement. The possibilities are endless -just make sure that they suit well for the decor that you want to present in your home.